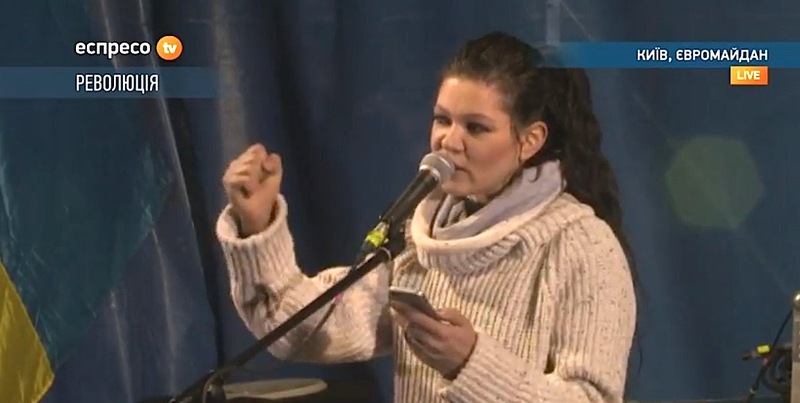 Maidan activist and singer Ruslana Lyzhychko keeps getting threats on her phone. She made an announcement about the threats during Viche [Sunday Rally on February 9] from Maidan’s stage. “Titushky have practically banished me from my house – they constantly watch it, and my neighbors relay the information to me. My car has been followed. I receive threats on my phone. I find it hard to adjust to phone calls where people say that they will do the same things to me as they did to Dmytro Bulatov. I want to ask them – what is so illegal that I do for them to use those methods against me?” Ruslana asked from the stage. “I am telling you, I will not go anywhere, nor do I plan to do so in the future, I will dedicate all my life so that this regime and this system are gone forever,” noted the singer. According to Ruslana, threats started after she talked about sanctions against the Ukrainian government in Europe. “A photo of the week in Europe – me on the covers of many printed editions, holding photos and information about fortunes and mansions of Yanukovych, Klyuev, and Zakharchenko. They do not understand that this is not done against them personally. I am shamed, my dear, for what you have done to this country,” she added. “I went to Munich, Brussels, Warsaw and everywhere, I talked about one thing only – sanctions,” Ruslana noted. “Let Yanukovych think about what type of situation he ended up in. It is nice to wave around a flag in Sochi… However, he was the first one to name people with national flags extremists,” she reminded. “You should not use the language of fear with us, we will not let anyone use it. I am on Maidan, and I will remain on Maidan,” said Ruslana. This entry was posted in "Voices" in English, English, Languages, Maidan Diary, Voices of Revolution and tagged #Amnesty_International, #Євромайдан, #евромайдан, #Human_Rights, #революціягідності, #ukraineprotests, #ukrainian_revolution, #whitehouse, Automaidan, civil society, Constitution of Ukraine, Dictatorship, EU, EuroMaidan, Kyiv, Maidan, Ruslana, Ukraine. Bookmark the permalink.